Artist's concept of Phoenix Lander. The sophisticated landing system on Phoenix allows the spacecraft to touch down within 10 km (6.2 miles) of the targeted landing area. 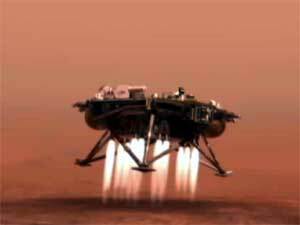 Thrusters are started when the lander is 570 m (1900 feet) above the surface. The navigation system is capable of detecting and avoiding hazards on the surface of Mars. 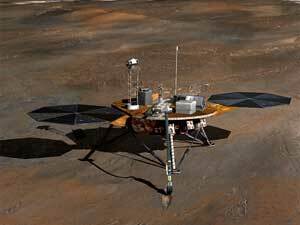 The Phoenix Mars Mission, scheduled for launch in August 2007, is the first in NASA's "Scout Program." Scouts are designed to be highly innovative and relatively low-cost complements to major missions being planned as part of the agency's Mars Exploration Program. In this artist rendition, the Phoenix lander is shown on the arctic plains of Mars just as it has begun to dig a trench through the upper soil layer. The polar water ice cap is shown in the far distance. Phoenix is specifically designed to measure volatiles (especially water) and complex organic molecules in the arctic plains of Mars, where the Mars Odyssey orbiter has discovered evidence of ice-rich soil very near the surface.